Presenting, Dave’s first-ever BACON EXPLOSION! It was very good, but this log serves 24 people. 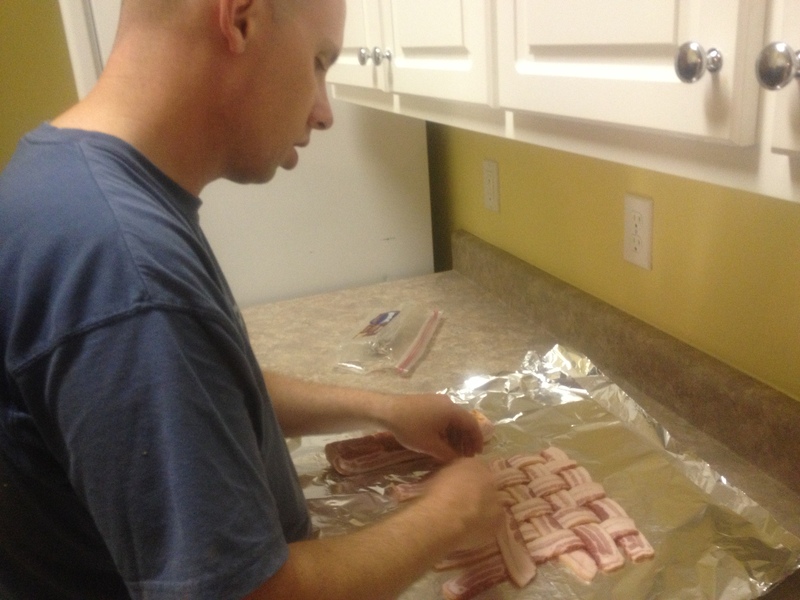 Dave’s squadron in Florida has an annual tradition: BACONFEST! One day, everyone shares their favorite bacon recipes. 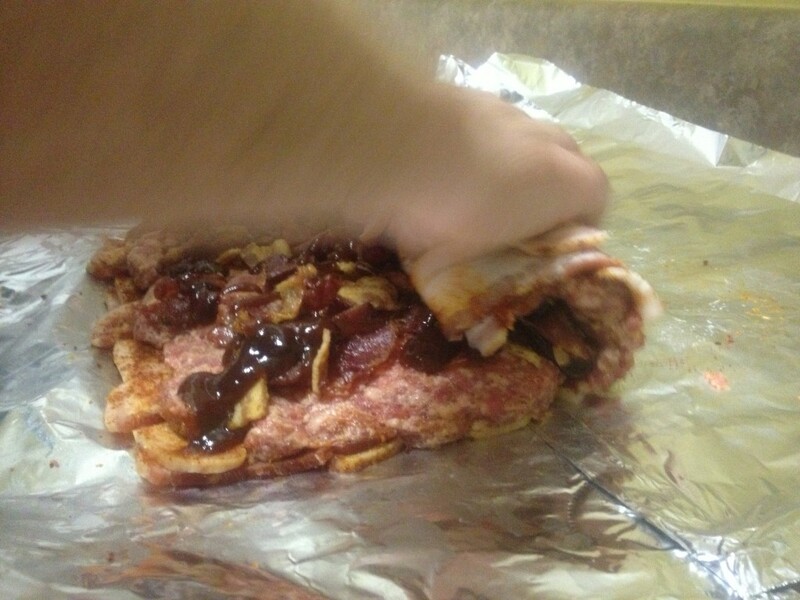 In 2011 Dave made bacon cream cheese roll ups, and I can’t remember what he did in 2012, if he did anything at all. 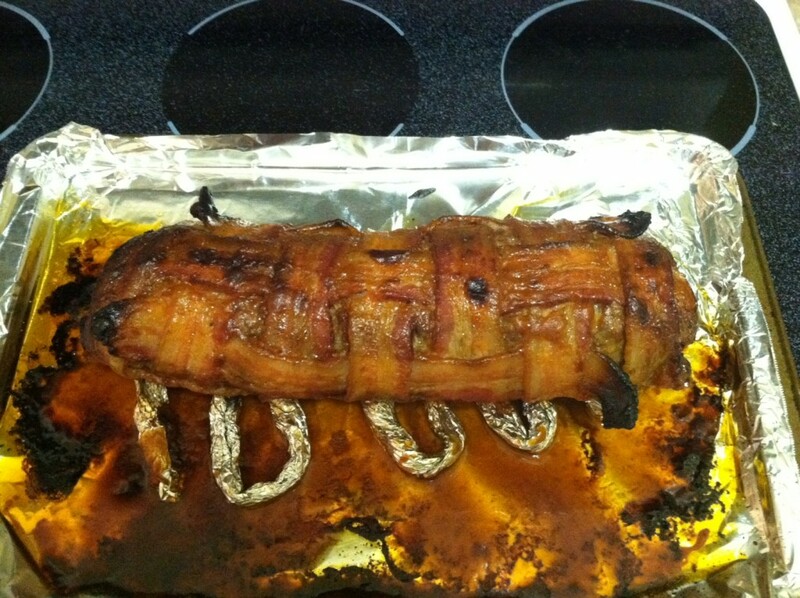 While it was tempting to make another beer-bacon cheesecake, this year Dave proclaimed, “I’M MAKING A BACON EXPLOSION!”. Almighty then…less work for me. His plan was to assemble the dish at home the night before and then take our smoker to work to cook it on the day of the event. 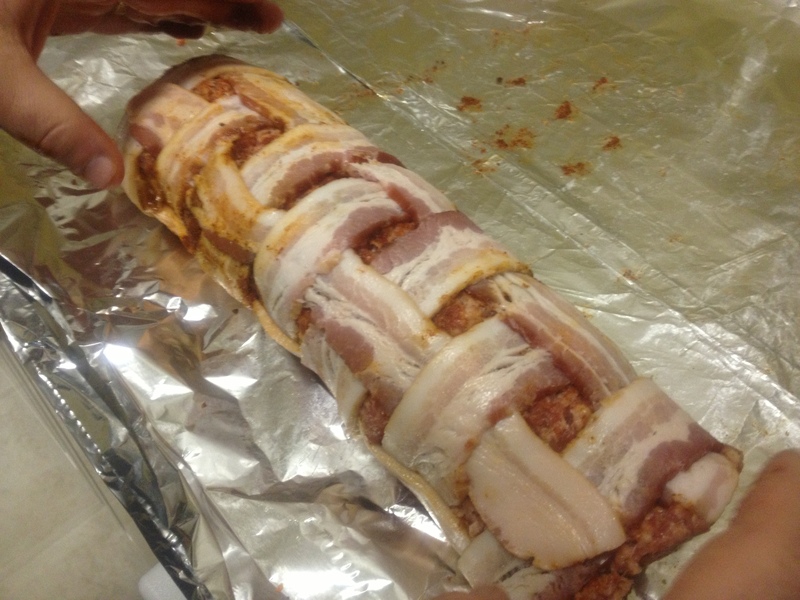 So…perhaps you’re wondering what a Bacon Explosion is? Let me refer you HERE for the recipe. Suffice it to say…it’s a LOT of meat! For the interior bacon crumbles, we used some leftover “ends and pieces” that I had bought for a homemade baked beans recipe over Memorial Day weekend. 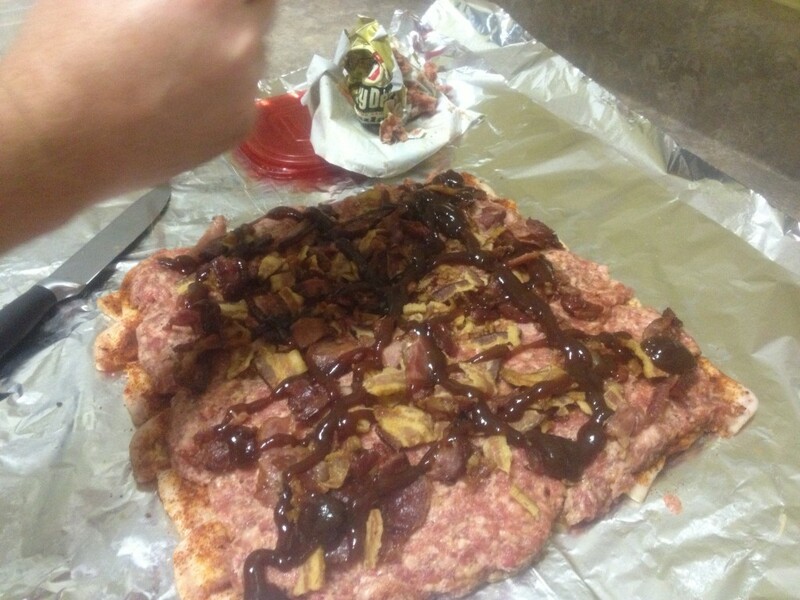 We used all the leftover barbecue sauce that was left in our fridge…no less than two different kinds…all mixed together. 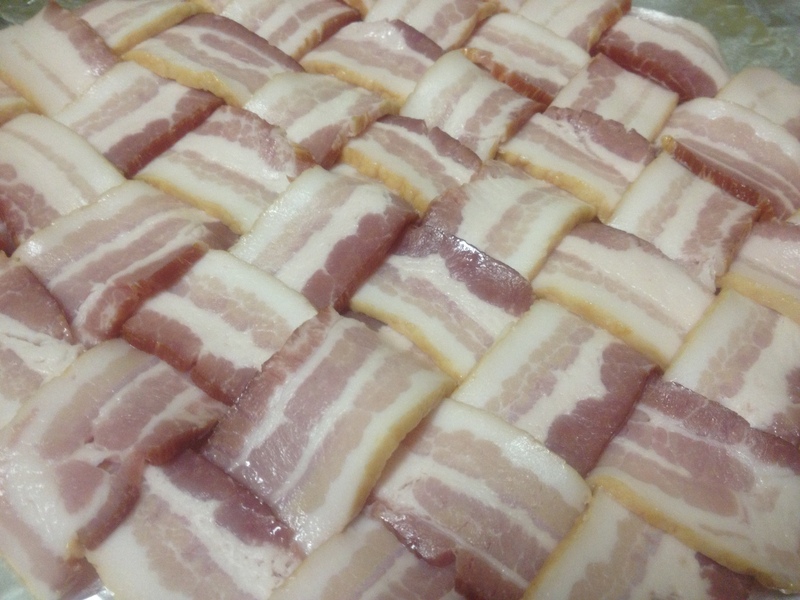 First you weave the thick-cut bacon into a square. 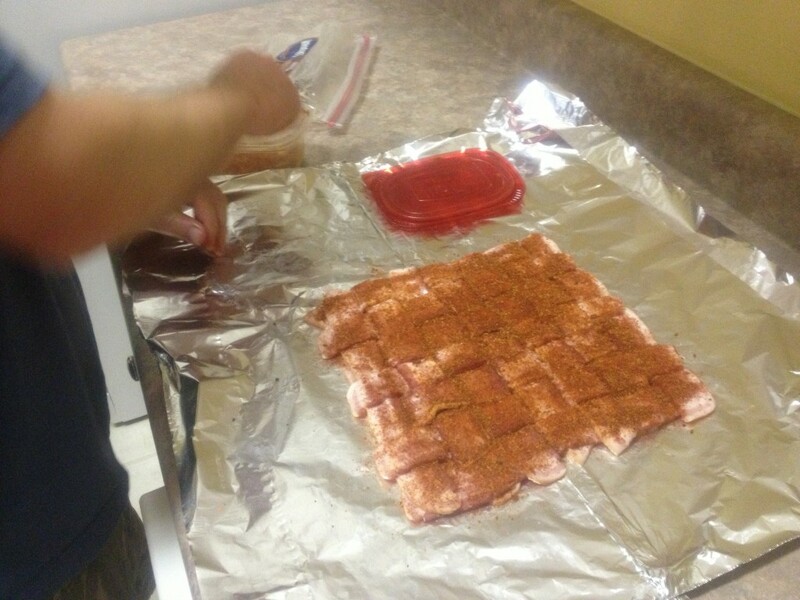 Next, cover the square in BBQ rub. Then, smear the 2 lbs. of bulk sausage all the way across the woven bacon. Use your hands, it takes forever otherwise. 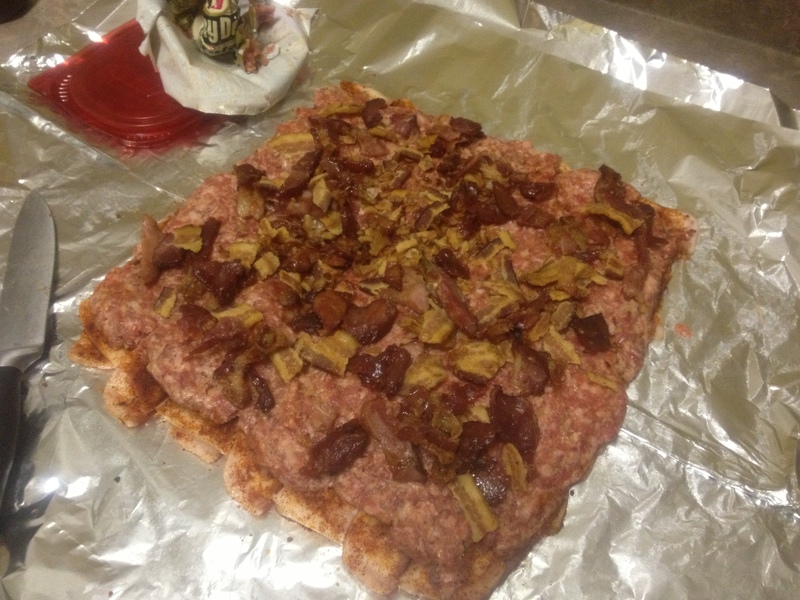 Next, sprinkle the crumbled baked bacon across the bulk sausage. Drizzle BBQ sauce over everything….feeling faint yet? 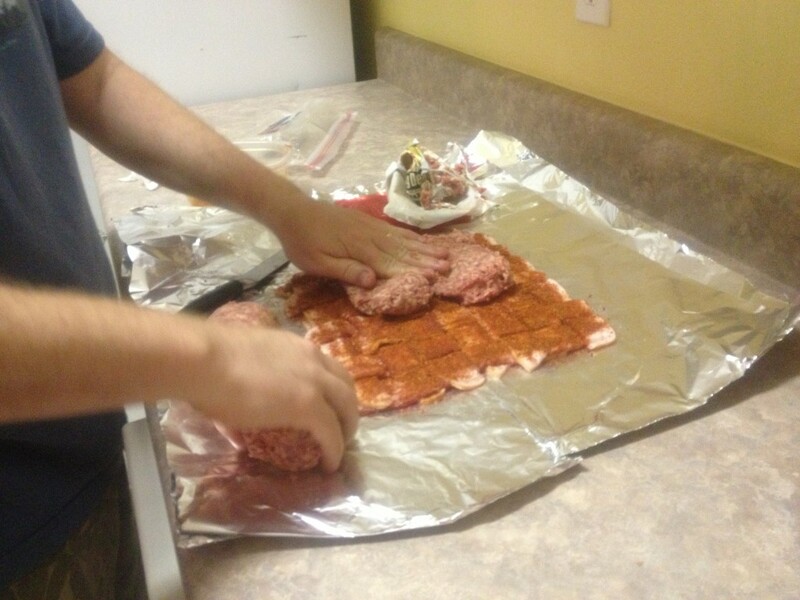 Then roll the whole thing up…. We weren’t sure if the weave was supposed to separate like that…in the photos it the recipe it didn’t separate, but it didn’t seem to hurt things. This can be smoked at 225F for 1 hour for each inch of roll diameter. So if the roll is 2.5″ diameter, then it would smoke for 2.5 hours. Dave grilled his on the camp stove, then finished it in another squadron member’s smoker. You may continue to glaze the outside with more BBQ sauce if you wish. Thinly slice the log into discs to serve…yummy!